Screwpiles are wound into the ground much like a screw into wood. Screwpiles are installed using various earthmoving equipment fitted with rotary hydraulic attachments. Machinery varies from skid-steer loaders to 5 tonne through 80 tonne excavators. Rotary hydraulic powerheads with torque capacities ranging from 5,000Nm to 500,000Nm are custom fitted using various boom configurations. Special drive attachments connect the screwpile to the machine. Correct installation techniques are paramount to meet engineered design load and settlement outcomes. 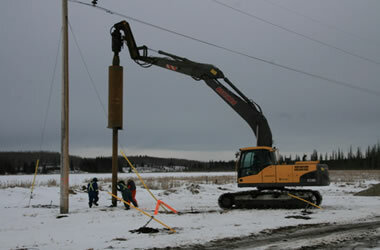 Dart Services is your one stop shop for screw piles in Estevan & Weburn Saskatchewan. If you're looking for a professional screw pile company in Estevan, Weyburn or anywhere in Saskatchewan look no further than Dart Services. Simply use our contact form to request a free quote for screw piles or related services.